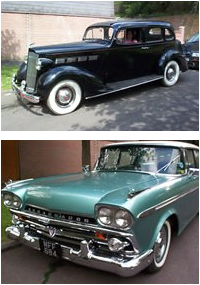 We restore all models to their original condition. This involves a detailed knowledge of the car, where to obtain the necessary parts, and an understanding of the technology that operated at the time. "Bodyjig" with measuring system employed. Good restoration is a high specialised operation. Prices vary considerably according to work that needs to be done - varying from a few hundred pounds to many thousands. We would be happy to inspect your vehicle and give you a quotation. Alvis Specials for sale and built to order in 2 litre four cylinder engines and three litre sixes. We will also build any make or model of specials to any specification, with prices upon application. Please contact us for further information. 1927 4.5 litre Brooklands Racing Bentley look-alike type special. Hand-built aluminium body, 4 cylinder, 2 litre, 4 speed gearbox, with Girling Rod brake system. With its Austin ("Healey" Model) Engine. A very popular and much sought after car of the post war late 1940s. A two door saloon with coachwork by Thrupp & Maberly. High powered 1275 cc GT model (with its special Janspeed exhaust system). This 4 litre saloon was fully repaired after being badly damaged in a head-on collision.